Aachen -like so many other German cities- clearly show the scars of World War II. The Allied Forces mercilessly bombed German cities of any importance in order to weaken the Nazi regime and Aachen was no exception. If not enough, Aachen also became in the frontline of an intense battle between the American and German army in October 1944, destroying large parts of the city. Luckily for us today some of the most important buildings were spared and still there to visit, among them the Aachener Dom. Aachen is nowadays a city with some 250.000 inhabitants and is situated close to the Belgium and Dutch border. Besides the Aachener Dom the city center contains interesting buildings like the Rathaus and the Elisenbrunnen, an 18th century center for the rich Europeans that came to Aachen for its curing Mineral Wasser Brunnen (mineral water sources). Such buidlings remind us of Aachen’s rich and important place in European history. 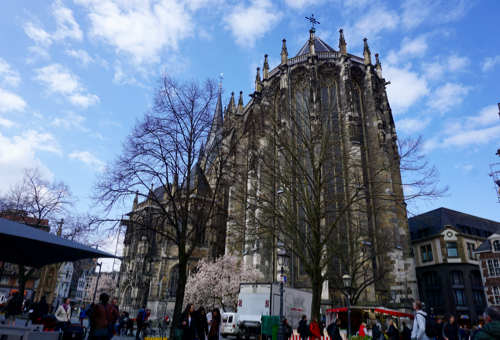 Of those buildings the Aachen’s Cathedral –Dom as the German people name it- is the most visible and important. 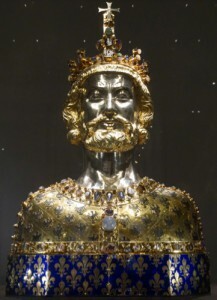 The history of the Dom goes back 1200 years when Charlemagne reigned in large parts of Europe and tried to restore the grandeur and importance of the Roman empire. 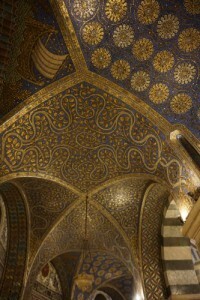 Charlemagne made Aachen into one of his residences within his empire. In Aachen he would settle a few months throughout the year with his royal court. In later times, during the medieval age the Dom was used to crown the German emperors. From the outside the Dom does not immediately impressed me like for example the Cologne Dom. It clearly consists of different parts that were built over very different periods and the ongoing constructions make it difficult to get a good overall impression of the outside the Dom. 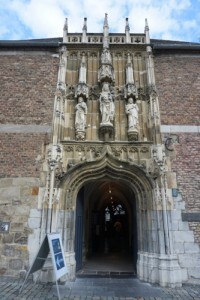 The entrance of the Dom might appear a bit underwhelming. We are entering here through one of the earliest stages of the church established by Charlemagne. In the entrance hall you pass by two very ancient Roman sculptures: a bronze pine cone and a wolf. 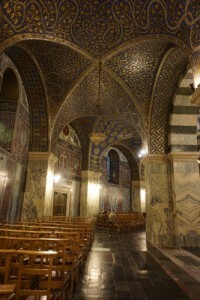 Then you enter the main hall of the Dom. This is a very impressive experience: the decorations on the walls and ceilings are truly splendid. 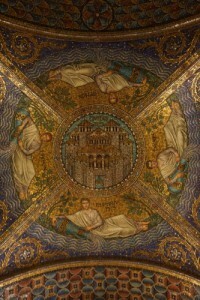 The decorations of the Dom’s ceilings. Keep remembering though that what you see are treasures from very different periods. Some of the golden relics date from between 1000 to 1400. 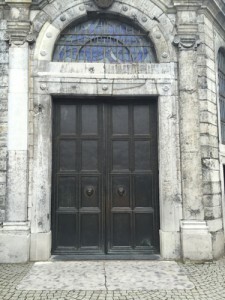 The main foundation of the church with its beautiful columns from marble and granite dates from the time of Charlemagne. The stained-glass windows are from relatively recent dates (post World War II). 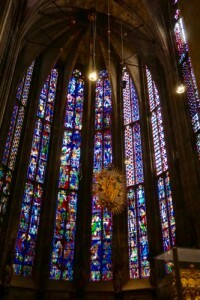 The stained-glass windows of the Dom. Civitatis Dei (Home of God), a beautiful mosaic. After your visit to the Dom I advise you to go to a close location: the Dom Information Center. Here you can reserve your place for a guided tour that allows you to visit places that are not accessible for the common visitor. The tour takes around 45 minutes and takes place every hour. The admission fee is around 5 euro. In the same office you can buy tickets for the Domschatzkammer, the treasury of the Dom. Tickets for the treasury a little more expensive than the tour tickets, buit it is totally worth visiting the treasury for there are so many beautiful paintings, sculptures, textiles and other objects to see. I do not pretend to have a very extensive knowledge of European cathedrals but from the ones I have visited I can say that the Aachener Dom is among the most beautiful places to visit. 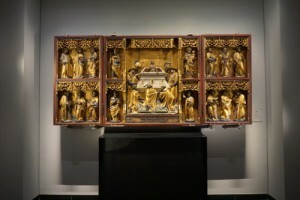 The DomSchatzkammer contributes to the experience of visiting a place that clearly shows the rich and glorious past of Aachen. Ewald Kegel, April 12th 2016, The Hague. This entry was posted in History, Vacation and tagged aachen, dom, schatzkammer, treasury room on April 12, 2016 by admin.